Despite America's tendency to pride itself on McMansions, many families are making it work--and work well--in just a few hundred square feet. 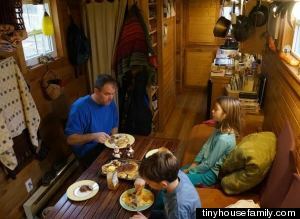 Hari and Karl Berzins joined HuffPost Live to talk about what life in a 168-square-foot home is like for a family of four. Initially, the Berzins lived in a standard home with about 1,500 square feet. But the economic crisis in 2008 changed that. "Our previous regular-sized home went back to the bank when our restaurant collapsed in 2008 along with the rest of the economy," Hari explained to host Nancy Redd. 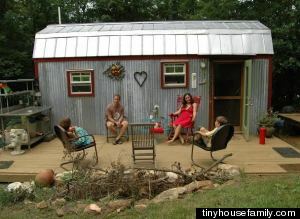 "We decided to go this small because we, after going through such financial stress, we decided to never use credit again. And so we saved our money and bought land for cash, and put in a well and septic and built a home that we could afford to build to completion so that we could live comfortably in our space while we continued to build the rest of our homestead." The home includes two separate lofted bedrooms (one of which is shared by the Berzins' two children), a kitchen, living room, dining area and bathroom. However, it is missing one important amenity, according to Karl: "The only thing that we're really missing out on is a bathtub. We have a shower, but there are days when we wish we had a bathtub. Outside of that, we're fine." While the Berzins try to keep their space as tidy as possible, they make room for the needs of everyday life. "Well there's lots of coats right now -- it's cold out. There's wet boots and snowy, muddy boots in the foyer. Right now there's a bunch of guitars and book bags on the couch. There's stuff," Hari said. "We still have the stuff of everyday life, but there's a lot of shuffling about."